Emu oil is a natural, omega rich oil that is refined from the fat of the emu bird. Emus are originally from Australia where they thrive in the harsh Outback weather. The oil is a fortunate by-product obtained when the bird is processed for its lean, healthy meat, feathers and skin. Aborigines in Australia have relied on emus for thousands of years as a source of food, clothing, and even jewelry. They were the first to discover that emu oil offered protection from the sun, worked as an excellent moisturizer, relieved joint pain, and was effective on bruises. Our emus are raised humanely with plenty of fresh air, room to run, a healthy diet and careful handling. 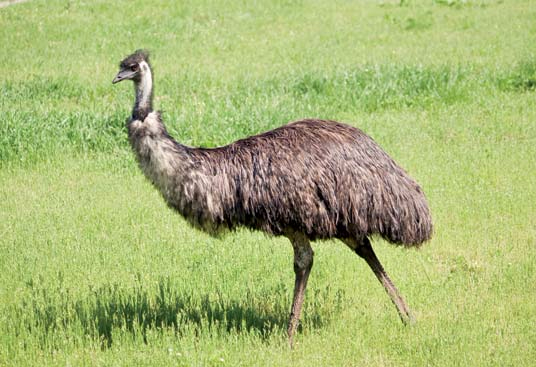 Oil for Emu Joy comes from emus that are raised on a single farm in the western United States. The emu ranch we partner with consists of 40 acres where they are raised free range, with every aspect of production handled by the family run farm. 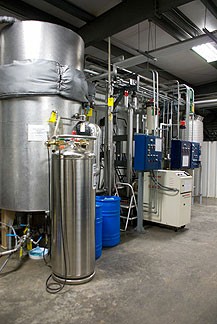 This allows us to monitor every step of the process to produce the finest quality emu oil products on the market. The emus are given different feeds for each stage of growth and enjoy a totally vegetarian (and organic as much as possible) diet that is high in protein, free of growth hormones, and contains no antibiotics. The birds are fed free choice whether they are baby chicks, yearlings, or breeders. All processing is done at U.S.D.A. inspected facilities. This ensures that the birds are handled humanely. Unlike most other animals that are raised for processing, a full 95% of an emu is utilized, including the meat, fat, skin, feathers and bones. All adult emus have a thick layer of fat on their back from which the emu oil is obtained. The fat goes through our all-natural refining process to bring you the highest quality Grade A emu oil. We use a process called physical refining that involves natural clay filters which absorb the impurities and preserve the oil. First, it’s specially rendered and cleaned. Insufficient rendering of the fat will affect the stability of the final product and prevent it from being considered top grade. After filtering, the oil is deodorized to remove any unwanted components. Since it comes from a natural source, it needs to be brought to an acceptable temperature for a precise period of time to ensure that bacteria and contaminates are completely removed. In the final step, the finished emu oil is carefully handled to ensure a quality and creamy product. This process is completed under FDA defined HACCP and GMP (Good Manufacturing Practices) for all food products. Our refined emu oil is then independently tested and approved by a certified AOCS (American Oil Chemists’ Society) chemist according to the American Emu Association Trade Rules. 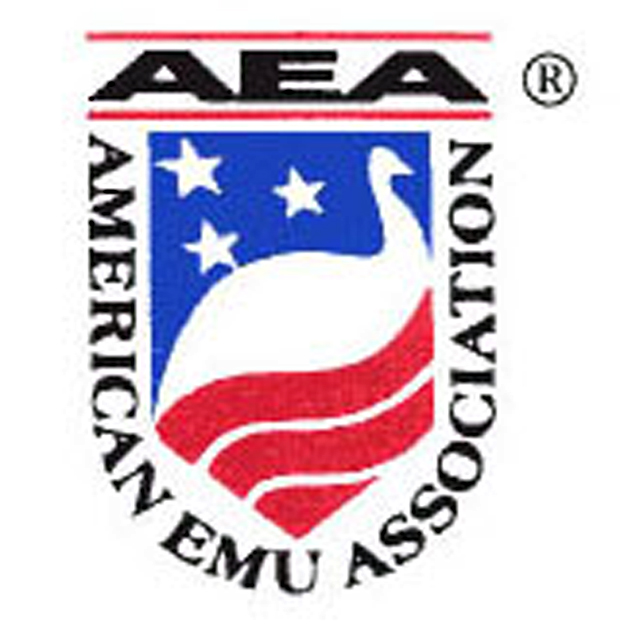 The refined emu oil then carries the AEA “Certified Fully Refined” seal. Not all emu oils are officially AEA Certified as it is a rigorous quality process. By choosing an emu oil which is AEA certified, you can feel confident you are applying a top of the line oil to your skin or hair. Emu oil is transdermal, meaning it penetrates directly and deeply into our skin. ﻿﻿Is emu oil safe to use? ﻿Yes. In fact, Grade A emu oil may be safely ingested and is made into capsule form as an excellent source for omega fatty acids which are essential to our bodies. With our all natural approach to emu oil, we use absolutely no petroleum by-products, artificial coloring, scents, or preservatives. It is gluten-free, chemical-free and fragrance-free. If you have sensitive skin, emu oil is also completely hypo-allergenic and non-irritating. It is also noncomedogenic, meaning it won't clog pores. The Department of Dermatology at University of Texas Medical School showed that emu oil in concentrations of up to 100% is non-comedogenic. This is one reason it’s so popular in cosmetic applications. It can help people whose skin is parched, cracked, or has lost its smooth healthy look. It has been reported that the oil also thickens aged, mature skin, making it appear younger. One study reported that 100 percent emu oil rubbed into the skin twice daily would thicken the skin by 14 percent. ﻿How does my skin absorb emu oil? ﻿Emu oil is transdermal, meaning “through or by way of the skin”. It’s lipid composition is nearly identical to our own skin, which is what allows it to travel through all seven layers of the skin. If you’ve used oil-based products that aren’t transdermal, the skin naturally attempts to block penetration. This barrier leaves the lotion or cream on top of the skin surface. Emu oil goes through to the inner layers where it can nourish newly forming skin cells or hair follicles. Our skin is phospholipid deficient which means it will not let anything containing a phosphorus molecule penetrate through it. Unlike other skincare formulations which do contain phospholipids, emu oil has no phospholipids so the skin allows it to penetrate much deeper and faster. This transdermal ability provides superior skin moisturization and effective delivery of other ingredients. This is especially important when the goal is to relieve pain and inflammation for muscles and joints. Emu oil’s fatty acid profile helps it relieve adverse skin conditions better than any plant based product. Omega-3 and Omega-6 in the oil increase production of eicosanoids which nourish skin and reduce inflammation. ﻿What is the shelf life of emu oil? ﻿Our Grade A emu oil has a shelf life of 1.5 to 2 years, varying based on your storage conditions. All products that contain emu oil should be stored at room temperature and never be exposed to extreme heat or sunlight. If you store it in the refrigerator, you must bring it back to room temperature for proper use. Emu oil has a creamy and semi-solid consistency that begins to liquify above 75F (24C). If your emu oil becomes very thick, hold the jar under hot water to warm it up so that it returns to a pourable consistency. If left undisturbed at room temperature for several weeks, it may divide into to fractions of liquid and solid cream. Separated, they don't contain the full benefits of the oil's components. You will need to shake and mix them together for the full beneficial effects. Beware of some companies that may only offer the top liquid component, claiming it as the "best" of emu oil. Both fractions are needed for the most benefit. Store your emu oil in a cool and dry place at room temperature. 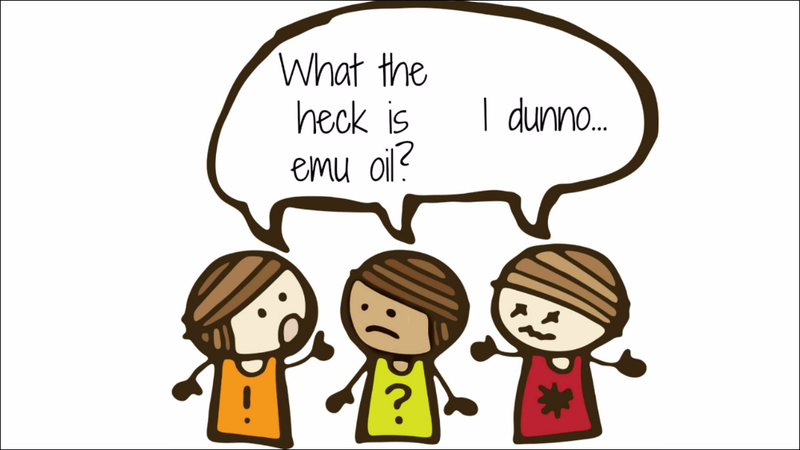 How can I tell which emu oil is the best quality? When you use products containing emu oil make sure you are purchasing from a reputable company. There are different grades that affect the shelf life of emu oil. Ours is Grade A which is the highest quality and lasts up to 2 years if stored properly in a cool. dry location. High quality refined emu oil has no odor, is light in color, and is very bland to the taste (fully refined emu oil can be ingested). A dark yellow, red or brown tint indicates a low quality product or a poor refining process. Some vendors use herbs or essential oils to cover up odors in lower quality oil. Also check to see where the oil was sourced. 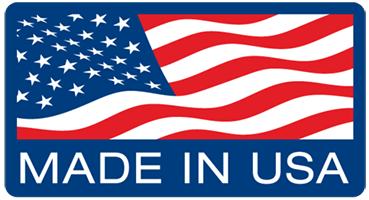 Oil from the USA that is AEA Certified is your assurance of top quality. While some emu oils from Australia also meet high quality standards, be careful about oil from other countries like China or India, which don’t have similar strict quality guidelines in place and may not raise the emus humanely like they are on our farm. ﻿What does AEA Certified mean and why is it important? 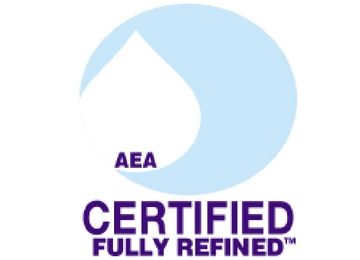 The “AEA Certified Fully Refined” seal is the reassurance that a third party has tested the oil for purity. To be approved, the oil must come from registered batches and be refined in an AEA Certified emu oil refinery and bottled by an AEA Certified bottler. An AEA approved refinery must provide proof that an AOCS chemist tested the batch and that it met or exceeded the criteria established by the Emu Oil Trade Rules for Fully Refined Emu Oil at the time of testing. Being AEA Certified is an honor that is extended only to those few suppliers who comply with all of the requirements. To verify that a particular batch number has been registered and approved as AEA Certified Fully Refined® Emu Oil, request the batch number from your supplier and contact certified@aea-emu.org for verification. ﻿Is emu oil an FDA approved drug? Unfortunately no. A major problem is funding. Even a small study with under 50 patients can cost more than $100,000. Large clinical trials like the FDA requires could cost more than $1,000,000. Companies with exclusive rights to a product can direct that kind of money with a realistic expectation of return on their investment. There is simply no incentive to put this kind of money into an FDA approval for a non-proprietary product such as emu oil. Each application (burns, eczema, psoriasis, etc.) for emu oil would have to endure the expense of a full FDA application process. Any company selling emu oil for an approved application could then use that data to their benefit without having shared in the expense. Where can I buy the highest quality emu oil?